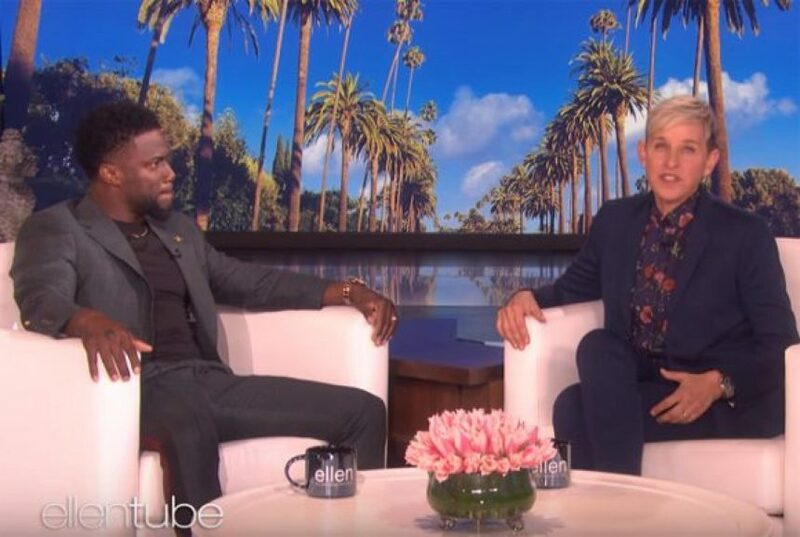 Twitter OUTRAGED At Ellen For Giving Kevin Hart A Pass — What Do YOU Think?? Home › Ellen DeGeneres › Twitter OUTRAGED At Ellen For Giving Kevin Hart A Pass — What Do YOU Think?? This is not a good look for Ellen DeGeneres right now — or is it? The daytime TV queen brought on Kevin Hart Friday to give his side of the Oscars controversy — and explain why he wouldn’t give in to the ultimatum to apologize for past homophobic jokes. Ellen not only forgave him, she revealed she’s called the Academy on his behalf to fight for his position. Ellen was not trying to hide her goal, straight up giving Kevin her blessing. But a great many offended members of the LGBTQ community were not ready to forgive and forget. See some of their very strong statements (below)! I expected Ellen to actually ask Kevin Hart some sort of challenging question. Anything, really. But instead, it was just one long monologue from Kevin interspersed with Ellen’s approval. That interview made me miss the previous talk show hosts that asked tough questions. I feel like if you’re not homophobic anymore, you shouldn’t mind apologizing for your past homophobia again and again and again. I don’t want to hear a hostile retelling of how we didn’t hear your meager apology the first time. I hate what Ellen did. She basically used her privilege and power while being largely known as a member in the LGBTQ to basically say well “I’m not offended”, when it’s not about her. He showed he was still homophobic when he refused to offer an actual apology! I've never met someone who has worked with Ellen DeGeneres and didn't have at least one story of her being extremely verbally abusive towards them. In light of Ellen absolving Kevin Hart for his history of homophobic remarks, this seems like a good time to reiterate that no one member of a marginalized identity can forgive a bigot on behalf of the entire group. Kevin Hart whines he didn’t even get 24 hours to celebrate his Oscars bid before his tweets resurfaced. Fighting for ones’ identity as an LGBTQ person is a lifelong battle that never, ever ends. I don't think saying things like "I don't have a homophobic bone in my body" helps because it's probably not true? We all carry some of these feelings with us, and it's ok to just own it, apologize, and ask how to move forward, and then commit to it. I think it's great that Ellen has found it in her heart to forgive Kevin Hart, and that's a powerful thing to witness. But I think the implication that he is now "forgiven" by all of us isn't fair, and I'd like to see his continued plans to work with and for the community. (2) …mob of people out to get Kevin Hart. It was a group of people who wanted to understand Hart's thinking about those hurtful tweets & his stand-up jokes. OK, so now you’ve heard both sides. We absolutely think people should be able to get a second chance and be forgiven for past words and deeds. People grow. People change. But when people grow, shouldn’t they be willing to show contrition for all the awful things they said? To prove it isn’t who they are anymore? A lot of people clearly just don’t think Kevin has done so yet.